Over the next year and a half, we’ll be theorizing about how the lead characters in the latest Star Wars trilogy might end up once J.J. Abrams brings this exciting new story to a close. So far we’ve looked at the villainous Kylo Ren and ace Resistance pilot Poe Dameron. Now let’s turn our attention to FN-2187 aka Finn, and where he might find himself come the series’ end. Finn, like Poe Dameron, hasn’t been given a ton of backstory on screen but unlike Poe who has a comic book series; Finn’s life largely remains unexplored. We know he was born in 11 ABY and taken at a young age and placed into the First Order cadet program, a program General Brendol Hux developed. But that’s where the details of his early years end. "You have great potential, 2187. You are officer corps material. Your duty is to the First Order above everything. Nothing else comes before that." We don’t know where he’s from or who his parents are, all we know is that as a cadet he was highly touted by Captain Phasma and was on his way to becoming an officer. His career in the First Order was railroaded by his own conscience as he lacked the fervor for violence and combat that was expected of him and his fellow future Stormtroopers. 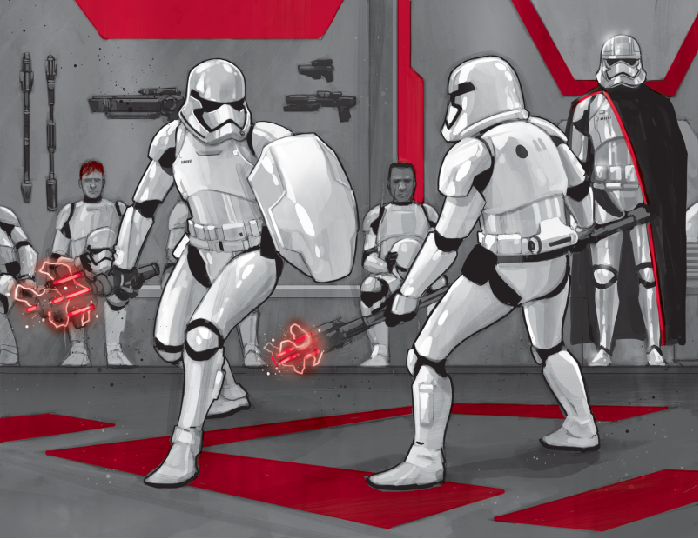 In the book “Before the Awakening” by Greg Rucka, we learn that the attack on the Village of Tuanul in The Force Awakens was Finn’s last chance to prove to Phasma he had the right stuff. As we now know, he failed that test and the slaughter of the villagers by his fellow Troopers was the straw that broke the Dewback’s back. So we have no historical context or lineage to use as clues when attempting to formulize an ending to Finn’s story thread. He’s a man without a past, a home, and that’s something that perhaps they will deal with in the final episode. Or does Finn’s story begin when he takes off that familiar white helmet in The Force Awakens for the first time? Is that his birth metaphorically speaking? It makes sense as he goes from FN-2187, a designation; to a person casting off what I’m sure can be very weighty armor at times. The way Finn slowly peels off the armor in the Jakku desert after the crash is him changing his skin, his way of life, his “self”. Perhaps it’s more important that we look forwards with Finn, towards the future, rather than backwards for clues. In The Last Jedi he learns what it means to be part of something bigger than one’s self and has found a surrogate family in the rank and file of the Resistance. He’s good friends with Poe, Rey and now Rose Tico and it’s likely one or all of the relationships will figure heavily in how Finn goes about living the rest of his life. Will he remain steadfast to the end like Poe most likely will? He once sought peace, quiet and anonymity but those days appear to be long gone. Finn has grown up; he’s learned that you have to fight for what you believe in, even though it took some time for him to figure that out. He fought and defeated Phasma on the Supremacy, referring to himself as “Rebel Scum”, something of a personal concession and was willing to sacrifice himself on Crait to save the other Resistance members before being “saved” by Rose. He’s come a long way in accepting that he doesn’t have to take on the galaxy by himself or seek refuge in it, he has friends now. And just like his friends, Finn is an orphan of war and will have to figure out a life for himself once this is all over. He has a knack for conversation and oozes charisma and charm, perhaps a life of politics would suit someone like him? As seen in The Last Jedi, he developed an aversion to elegance, especially if it was off the backs of others, so it’s the simple life for Finn then? He managed a couple of relationships in the First Order and surely there are more “soldiers of conscience” kicking around. Among the troops he developed bonds with were FN-2000 (Zeroes), FN-2003 (Slip) and FN-2199 (Nines) who like the Clone Army before them became a sort of brotherhood. In fact, it was “Slip” who died at the beginning of The Force Awakens leaving a bloody handprint on Finn’s helmet, sending him into a tailspin. As the First Order starts to crumble, as I believe it will, will more see the error of their ways and change their tune the way Finn did? Finn is a popular character amongst “shippers” and at any given time is being paired with Rey, Poe or Rose. At the end of The Last Jedi, Finn had found a partner in Rose and seemed to be moving on from Rey but could it be he simply felt responsible for Rose’s well-being after Crait? Rose played a major part in helping Finn grow as a person and I’m sure he’ll never stop wanting to repay that debt of gratitude. At this point I’m not sure they’ll squeeze romance into the final chapter as there’s plenty to wrap up here in a short amount of time. What does everybody think? What does the future look like for Finn?